Very sassy! Black patent high heel sandals featuring a 5½in silver chrome stiletto heel. The are 3 narrow cross straps at the foot, a double ankle strap with buckle fastening and closed back heel. Made by Pleaser USA – well-constructed footwear on the edge of fashion. Fabulous high heel sandals in black patent with an eye-catching silver chrome stiletto heel and platform sole. There are 3 narrow straps across the foot and there are twin ankle straps with buckle fastening. These high heel sandals also have a suede sock for added comfort and grip for the foot. Made by Pleaser USA who have a reputation for well-constructed footwear on the edge of fashion. Sizes are in US sizes and we have given the equivalent UK and Eur sizes. The standard conversion for US to UK footwear is a 2.5-size difference, although with open-toe footwear a 2 size difference may be more appropriate. Our Sizing Information gives more details. 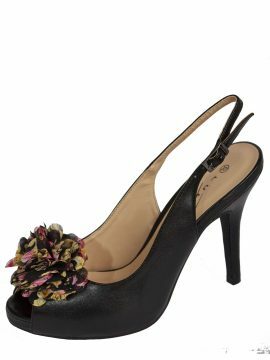 This is the classic stiletto high heel court shoe. Stylish and well-constructed high heels by Pleaser USA. 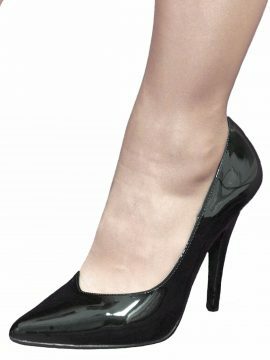 The shoes are shiny patent and have a 5in stiletto heel plus pointed toe. In black, red or white. Sorry - only size UK 3-3.5 remaining. Please see our Product Description below for full details and important sizing information. Feminine and elegant black patent high heel sandals from Pleaser USA, known for their well-constructed footwear. They have a 5in stiletto high heel, a closed heel and two cross-straps at the front, plus a single ankle strap. The inside of the shoe has a suede sock which gives added comfort for the foot. Note: The image shows the shoe with a plastic insert to hold it in shape for the photograph. Please see our Product Description below for full details and important sizing information.